Chalets w / 1 and 2 dormit. p / 4 and 6 people in cond. w / pool and bbq. Chalets condo with pool and barbecue in the common area outside and homemade on site. Ample chalets in masonry, with 1 and 2 bedrooms with balcony ceiling fan, bathroom, living room, with TV, balcony, kitchen cupboard equipped with utensils, table for up to 6 people, 4 burner stove and oven, refrigerator and area of service. - At least 04 people for 02 days. Within each cottage contains the bathroom sink, and shower in separate rooms. Alugamos um chalé no feriado do dia do trabalho para 4 pessoas. O chalé é muito bem equipado, aconchegante e confortável! Poderíamos passar semanas ali, com muito conforto. Existe um mercado bom bem próximo ao local. A proprietária é muito simpática e tirou todas as nossas dúvidas. Valeu muito a pena, pretendo voltar com certeza! 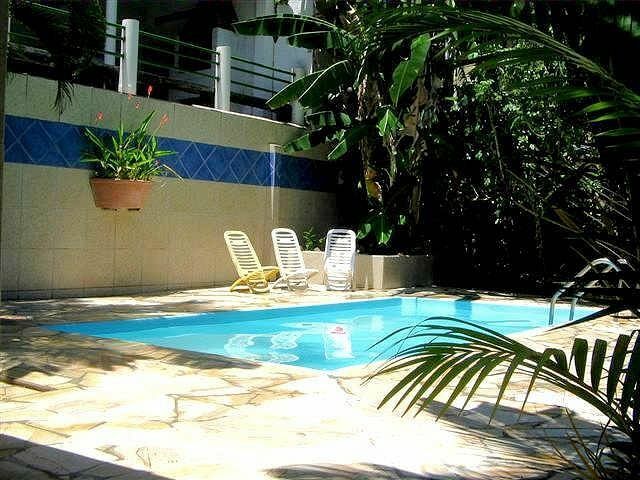 Located 200 meters from the Av Itaguassú beach, street sidewalk, between the ferry and the village. This beach is the first after the Perequê, 02 beaches before the center or the Village. Nearby shops: bakery, mini market, butchers are within 50 meters. Pharmacy, bike rental, schooners, tours and restaurants.